An ambitious young New Yorker (Kristen Bell), disillusioned with romance, takes a whirlwind trip to Rome where she defiantly plucks magic coins from a fountain of love, inexplicably igniting the passion of those who threw them in: a sausage magnate (Danny DeVito), a street magician (John Heder), an adoring painter (Will Arnet) and a self-admiring model (Dax Shepard). But when a charming reporter (Josh Duhamel) pursues her with equal zest, how will she know if his love is the real thing? $12.350 million on 2456 screens. While many romantic comedies stretch believability, 2010’s When in Rome takes the genre into a literally magical realm. Beth Martin (Kristin Bell) acts as a curator at a New York museum and experiences a long string of romantic flops. Beth’s younger sister Joan (Alexis Dziena) meets an Italian guy on a flight, gets engaged after two weeks and plans to wed only days later. This sends Beth on a quick jaunt to Rome to attend the ceremony. While there, she meets best man Nick Beamon (Josh Dumhamel) and shows some chemistry with him. However, when she plans to make her move, she sees Nick with another woman and feels self-loathing about her romantic misery. As she gets drunk and dips in an alleged “fountain of love”, she removes some of the coins would-be lovers tossed there in a tipsy attempt to spare them misery. Bad move. It turns out that the fountain boasts true magical powers, so each of the guys who tossed coins falls in love with Beth. This list includes a roster of oddballs – and apparently Nick! Beth has to deal with the unwanted romantic attention and her attempts to figure out if Nick’s affection is real or fantasy. Here’s something I know for sure is real: my hatred of this awful movie. Perhaps “hatred” is a little strong, for a movie as inconsequential and superficial probably doesn’t deserve such a strong emotion. But hatred greets Rome whether I like it or not. I expect little from silly rom-coms like this, but Rome has so many problems that it can’t even live up to the most negligible of expectations. Where to start? On the least negative side of the ledger, Rome does boast a competent to good cast, particularly in the supporting realm. While the film doesn’t generate a single laugh, its secondary characters occasionally manage to make it less painful. In particular, Dax Shepard’s vain male model has some almost sort of bordering on entertaining bits, and the presence of folks like Danny Devito and Anjelica Huston adds a little class. Unfortunately, our leads fizzle. I don’t think that Bell and Duhamel lack talent, but I don’t feel they can carry a film like this. They exhibit precious little chemistry together and leave a void at the movie’s center. A more magnetic pair like George Clooney and Sandra Bullock might be able to keep our attention, but Bell and Duhamel just don’t grab us and deliver the goods, whether in a comedic sense or as a romantic couple. 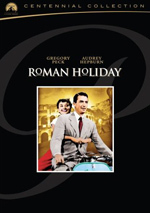 Not that I’m sure Hepburn and Bogart could do anything to keep Rome from sinking. Idiocy abounds. Admittedly, I don’t expect stellar logic from a movie in which coins retrieved from a fountain cause people to fall in love, but Rome nonetheless depends on far too much contrived material to succeed. Within its framework, it often pushes its luck – and our willingness to suspend disbelief. If the film generated any actual comedy, then its flaws would seem less egregious. However, not a single amusing moment occurs during its 90 minutes, and most of the material falls under “jaw-dropping” in its awfulness. The film abounds with all sorts of bad slapstick and gags we see coming from a mile away. Particularly horrible: the gay Italian priest who falls for Nick. In one of the worst attempts at cleverness I’ve ever seen, Rome winks at us when it reunites Jon Heder with his Napoleon Dynamite co-star Efren Ramirez. There’s no reason to cast Ramirez other than for whatever lame surreal value appeal this choice offers; in fact, as the Blu-ray’s deleted scenes and outtakes show, the filmmakers originally used a different actor in the Ramirez part. Perhaps the five people who watch Rome and get the Dynamite connection will find the pairing funny, but I just think it’s a desperate stab in the dark. Speaking of which, Rome wants so much to be wacky that it stages a romantic dinner sequence between Beth and Nick at a restaurant that literally forces its patrons to eat in darkness. Perhaps this intends to mock the pretensions of Manhattan hot spots, but it simply becomes another example of the film’s idiocy. Maybe more talented hands could’ve made the premise biting and/or funny, but here it turns into nothing more than yet another stupid slapstick piece. Admittedly, I’m not the target audience for this sort of romantic comedy. 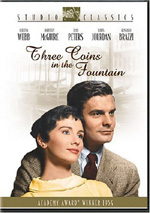 After all, When in Rome acts as something of an update on another bad film, 1954’s Three Coins in the Fountain, and it aims for the “chick flick” demographic. Being outside of a particular audience doesn’t mean I can’t judge awful movies, though. Genre-related excuses aside, Rome is simply weak filmmaking without any creativity or spark to make it go. When in Rome appears in an aspect ratio of approximately 2.35:1 on this Blu-Ray Disc. The movie offered a competent transfer but not a terrific one. Sharpness became an occasional issue. Though much of the film looked pretty concise, sporadic examples of mysterious softness crept into the presentation. This hit close-ups more than wide shots, which was unusual. It appeared as though the cinematographer tried to soften Kristen Bell’s features, a decision that would make sense if she was 50 but doesn’t seem logical for a young actress. Whatever the motivation, this left parts of the movie moderately soft. No concerns with jagged edges or shimmering occurred, and edge enhancement remained minor. Source flaws also failed to create problems. In terms of colors, Rome went with a palette that favored a golden tone. This isn’t unusual, as many rom-coms do the same thing, but the degree to which Rome featured a stylized palette surprised me. The image bordered on brown at times, and that gave it a slightly unattractive tint. When the film got away from this heavy tone, the colors appeared pretty clear and concise. Blacks were deep and firm, while shadows showed good delineation. Much of the transfer looked fine, but the less attractive parts left it as a “B-“. I thought that the DTS-HD MA 5.1 soundtrack of Rome seemed fine but it didn’t excel because of a lack of ambition. Like most comedies, the movie featured a limited soundfield that strongly favored the forward channels. It showed nice stereo spread to the music as well as some general ambience from the sides. Panning was decent, and the surrounds usually kicked in basic reinforcement. A few scenes opened up better, though, like at the wedding; that sequence boasted lively music, and a thunderstorm boasted good pizzazz. However, most of the movie stayed with limited imaging. A smattering of fairly minor extras fleshes out the set. We start with an Alternate Opening and Ending. This reel lasts at total of seven minutes, 17 seconds and features “Alternate Opening: Take a Deep Breath” (6:18) and “Alternate Ending: Underwater Mummy” (0:59). The former shows a different form of humiliation heaped upon Beth at the museum, while the latter gives a little coda to the Jon Heder character. (Both are totally unrelated.) The ending is unnecessary, while the opening connects less well to the film’s story; the existing intro sets up the plot much better. For behind the scenes material, we head to Crazy Casanovas: Mischief From the Set. It goes for 12 minutes, 28 seconds and we hear from director Mark Steven Johnson, producers Andrew Panay and Gary Foster, production designer Kirk M. Petruccelli, sculptor Giovanni Gianese, and actors Will Arnett, Josh Duhamel, Kristen Bell, Dax Shepard, Danny Devito, Luca Calvani and Jon Heder. The show looks at characters and story, cast and performances, shooting in Rome and sets. Much of this falls in the “fluffy promotion” category, though a few fun moments occur. The program’s nothing special, but it’s watchable. More cut footage shows up under Extended Pain with the Suitors. During its two minutes, 39 seconds, we see added shots from Beth’s climactic museum show. Like everything in the final film, these are relentlessly unamusing. Kerplunk! : Bloopers from Rome fills three minutes, seven seconds. It boasts the standard array of goofs and giggles. A few slightly amusing outtakes appear, but most of this stuff is forgettable. Eight Deleted Scenes occupy a total of seven minutes, 45 seconds. These include “Getting Married” (1:03), “Playing Cat and Mouse” (0:57), “Setting the Record Straight” (0:53), “Throwing Out Mummy” (0:57), “It’s the Naked Lady” (0:56), “The Saddest Thing” (1:39), “Look Both Ways” (0:28) and “Suitors Make a Scene” (0:52). Since nothing funny shows up in the final film, is it possible they left some gold on the cutting room floor? Nope. We get a little more exposition, but mostly we just find cut shots of the suitors, none of which become amusing. Two Music Videos follow. We discover reels for “Starstrukk” by 30H!3 Featuring Katy Perry and “Stupid Love Letter” by Friday Night Boys. The former is a perfectly awful little piece of synth fluff, but Perry is super-hot and she romps in a fountain, so the video’s enjoyable. It also gets points for the way it ties into the movie but doesn’t show any film clips. As for “Letter”, it also attempts a story, but it depends a bit too much of lip-synch band shots and movie snippets. The song itself is plastic Auto-tuned rock. Add to that the singer’s idiotic hairstyle and it’s a bust. A few ads open the disc. We get clips for The Sorcerer’s Apprentice, Lost and Blu-Ray Disc. These also appear under Sneak Peeks along with promos for Alice in Wonderland and ESPN World Cup 2010. No trailer for Rome pops up here. Though it boasts a decent little fantasy rom-com premise, When in Rome fails to do much else right. It comes with a pervasive sense of stupidity and produces nary a laugh during its 90 minutes. The Blu-ray offers decent but unexceptional picture and audio, and its supplements remain modest. Even if the theme sounds fun to you, I’d still advise that you stay far away from this dreadful movie; it’s a romantic comedy that’s neither romantic nor funny.